Inorder to understand any thing while reading, imagining it is very important which is the crux behind any read. In our nursery and primary levels books were more picturesque helping us to visualize but as we grew older and jumped to higher classes, the books were filled with texts and very few pictures and animations.With a lot of reading we make our brain visualize the content. When we study about academics, images or examples or real life examples substantiate our understanding. Or sometimes good discussion with peers or colleagues imbibes the learning deeper into our brain. But sometimes, the complexity of the subject restricts us to visualize further and that is when we are at a juncture either trying hard to understand or hate that subject. For example subjects like science, religion, philosophy, psychology, etc it is so very important to substantiate our learning with some images or case studies or stories etc. More often we rather prefer discussing and upon getting interested we pick a good book to read but unfortunately find the language with twists and turns which disappoints us. I blame the book not the reader. "A guy comes home from a business trip and finds his wife in bed, a nervous look on her face. He opens the closet to hang up his coat, and finds his best friend standing there, naked. Stunned, he says, "Lenny, what are you doing here?" Lenny shrugs and says, "Everybody's got to be someplace." In this gag, Lenny is giving a Hegelian answer to an existential question. The question is about the existential circumstances in the here-and-now, but the answer is from a grand, universal vantage point, what the latter-day Hegelian Bette Midler called “seeing the world from a distance." 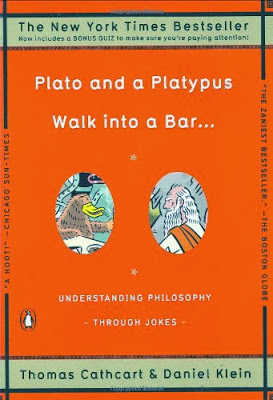 The book starts with a dialogue between Tasso and Dimitri, and their conculsion is the start of a philosophical concept which is well explained by hilarious illustrations.The book continues to entertain and simultaneously educate the reader with its gags on philosophy with the same intensity from its first to last page. If you are looking for an introduction to philosophy or want to have a feel of it or if you want to understand something complex easily then this book is for you. 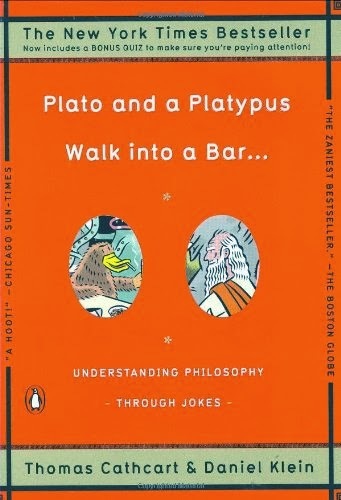 This book can also be picked by any avid reader as it falls more in the humor genre than to philosophy. This book wont disappoint the reader at all at any instant and would surely entice the reader to walk in the labyrinths of philosophy.